Generate Blunks by creating idlers or steal them from your opponent via Agros. Don't like your Blunks stolen? Create a Fenda to block and reflect shots back. Beware The Crazy Wizard who brings about chaos with its antics. 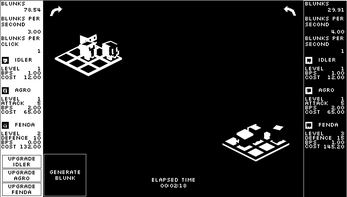 I've created this game for the 1-bit click jam. 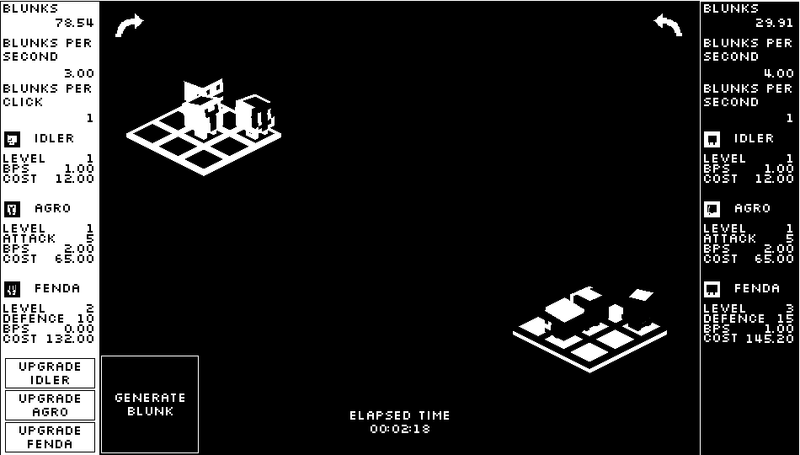 I wanted to attempt to make a different spin on the typical click and watch style of idle games. Once I got started I wondered how far I could actually take this concept. I'd love to spend more time on this, but I really would like feedback before I continue forward. Agro fires shots only if friendly units are not in front of, or directly behind. The Wizard appears every 60 seconds unless it has been in combat. It then has an unsaid resting period before it comes back.